This peak is not in the book. Judi Steciak and Carl Hamke provided the following route information. Livingston Douglas made the first recorded descent of the peak’s Northeast Ridge Route in 2016. His route is set out below. This peak is located one mile NNW of Ryan Peak. From the East Fork Salmon River Road and then FS-063 (C)(3)(p. 242) which leads up West Pass Creek, drive to where the road has washed out at ~7,300 feet. Wade the creek and follow the road to where it crosses the 7,600 feet contour. 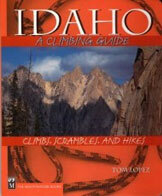 From here, climb up to the saddle south of Point 9,576. Follow the ridge south and contour into the drainage east of Point 9,981. Follow the drainage up and gain the northwest ridge, the west face, or the southwest ridge to the summit. 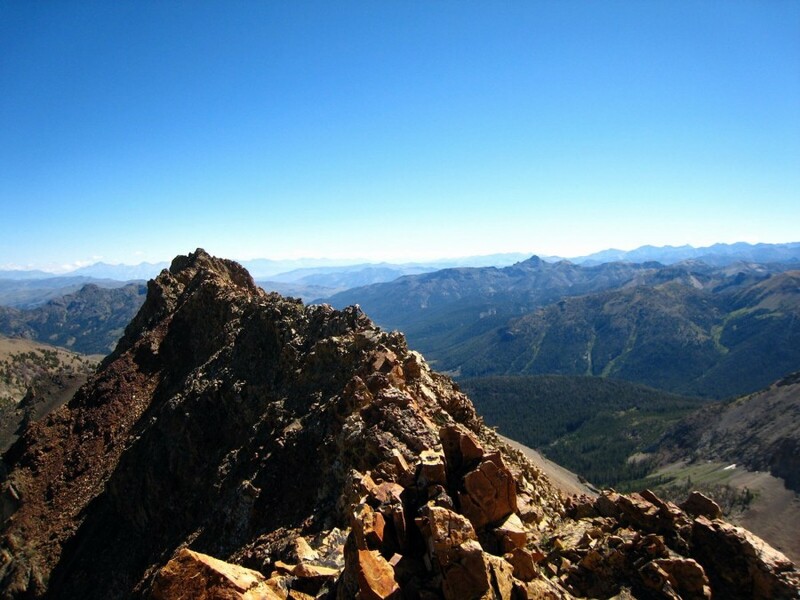 Enjoy the view of the north side of Ryan Peak. Judi Steciak and Carl Hamke put this route together on October 10, 2010. West Pass Road [FSR-063(C)(3)]. Follow the Steciak/Hamke route to the summit of North Ryan Peak, reaching the summit via the peak’s Northwest Ridge. This route is part of a ridge traverse from North Ryan Peak to Griswold Peak. After hiking up West Pass Road and following the Steciak/Hamke route to the top of North Ryan Peak, I began a tedious ridge traverse from North Ryan Peak to Griswold Peak. This is the first leg of that ridge traverse. It covers the ridge scramble from the summit of North Ryan Peak to the first ridge saddle (10,380 feet), which is also the lowest saddle between North Ryan Peak and Griswold Peak. 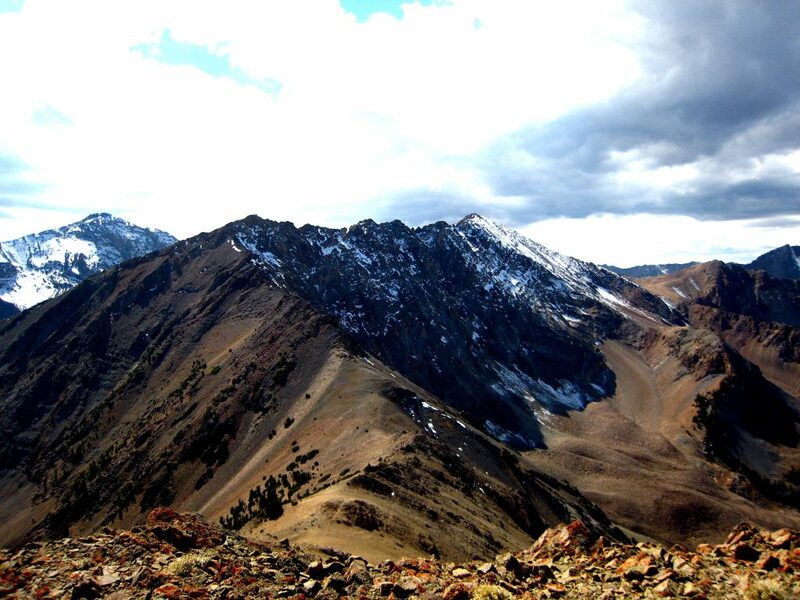 This saddle is located approximately 3/4 mile northeast of North Ryan Peak. 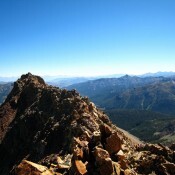 From the summit of North Ryan Peak, follow the ridge NNE. Stay on the south side of the ridge crest to avoid numerous ridge towers. The north side of the ridge is very exposed in many spots, so avoid it. This is a VERY SLOW, TEDIOUS TRAVERSE. It took just over 1 hour and 15 minutes to cover this 1-mile stretch of ridge. Yes, that’s how bad it is. While it’s never worse than a Class 3 difficulty, the side-hilling and numerous arete and gully crossings are exhausting. Here are the ups and downs along the way (North Ryan Peak-to-Saddle 10380): Down 250 feet, Up 150 feet, Down 60 feet, Up 20 feet, Down 100 feet, Up 175 feet, Down 700 feet. The Ryan Peak quadrangle does not do justice to how choppy this ridge is and how difficult it is to navigate past the numerous ridge towers by working across the many aretes and gullies on the south side of the ridge. I thought that it would never end. left/north. You’ll have your eyes on that ridge turn as you struggle with the ridge traverse, hoping and praying that you’ll eventually reach it. It takes about an hour of hard work to reach the turning point. Life gets immeasurably easier now. The final 0.5 mile descent to the ridge saddle is a straightforward Class 2 scramble with some rocky ridge outcrops to navigate. This section of the ridge traverse takes less than 20 minutes to complete. The remainder of the North Ryan Peak-to-Griswold Peak ridge traverse is covered in the South Ridge Route of Griswold Peak discussion.